“We arrived back in Kathmandu after the long and bumpy bus ride. The road to Kathmandu winds perilously along the side of steep, jungled mountainsides with a cold blue river raging far below. The road is narrow and often has no protection from the thousand feet of drop. Following the somewhat morbid but expected thought of how often a vehicle goes off the side, I caught a glimpse of a tangled, twisted metal chunk of bygone bus on the rocks below. Ok, better to enjoy the stunning beauty and leave that thought behind!! We arrived at the guesthouse that I inhabited not even two years ago on my last visit. Coming back here has felt like a true full circle. Especially when my friend and Nepali rock hero Robin Tamang came roaring in on his Royal Enfield Motorbike to meet with us. Robin had agreed to be our host to an orphanage he has been working with closely for the last 9 years. Two years ago I played an inspirational show with Robin and his band The New Revolution for the kids at this very place. 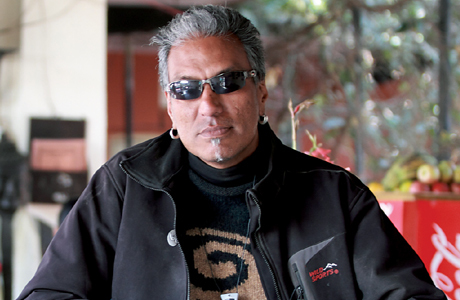 Robin has the uncanny presence of a rock star wherever he goes; he is passionately dedicated to the Nepali people and to the hearts and minds of the children. Thus this man has made children the target of his work. He believes that the key to changing the failing infrastructure of this nation is to touch the minds and hearts of the kids now. And he is doing it as well as it could be done. You can see the love and starstruck awe in the eyes of every Nepali we see as we make our way to the orphanage. We arrive through the gate and are immediately swarmed with kids. The older ones remember me quite well, and all are enthusiastic to see Robin; not as a rockstar, as he has been a frequent uncle-like figure since many of them were in diapers. They love him with the complete child-like adoration for a beloved relative. Where the kids in Chitwan were not as touchy-feely, we quickly found the opposite here in Kathmandu. The loping game I played in Chitwan very quickly became eight or nine kids vying for real estate on my arms, shoulders and back. Thus wearing a full, squirming suit of children I would try to move in any way possible. Needless to say I got my exercise! This orphanage, NAG, has been run by a Swiss woman named Nicole for 20 years. Her work has been remarkable; the grounds of the school are beautiful and some of her first children are now the teachers and managers of the school. She finds children with either no parents or incapacitated parents and gives them more than just a second chance, she gives them access to one of the most diverse and best educations they could hope for. With the help of Robin they even have an entire music room with keyboard, drums, guitars and more! These children are truly blessed, and have seen the darker side of what life can offer as well. This balanced experience augments the delight that shines from their eyes so that they radiate a zest and vigor that inspires. We gathered a group of the younger kids together to teach them the two songs we were to record. Robin stepped into the performers role beautifully and guided them through the syllables that he himself had just learned. The kids took to both songs written by Richard Gannaway enthusiastically and in no time we were recording them in chorus. We recorded individuals as long as their attention spans could handle and then played with them some more. We left and promised to return the next day. The Next day found more of the same. While I was not recording I can honestly say I had at least two kids strapped to my arms or back, minimum, at all times. I found a game that proved to be more restful with a group of around 12 boys. I would simply fall in any direction and they would push me back up to standing. I got to a point where I could trust them well and would fall rapidly in any direction, at which they would (usually) catch me before hitting the ground. Even as we loaded up into our taxi to leave I had kids clinging on to me. It was sad to leave! We decided to go directly to Durban Square, the historic and ancient center of the city. There we were greeted by statues and pagoda like temples with intricate wooden carvings, and the white stone Royal Palace. We explored the ancient city for a while as normal people would, though I was itching to play with this place on a more creative level.. I found some lion statues and began to find ways to do yoga poses on and with them; developing quite a crowd in the process! I played with a few of the kids in the square too, some were imitating my yoga, others showing off their break dancing skills. We played at this and other games until the sun set and it was time to go. Unconventional interactions with my environment always seem to lighten up any place I find myself. I was able to interact with an entire group of people who would have been normal passerby’s if I hadn’t stopped to turn the world on its head for a moment. I hold sacred the opportunities to imbue the creative essence of this life with the environment and people around me. If one person smiles as a result then it is a success. My hope is that others may be inspired to look at the world they live in with the imagination we were born with, sidestepping the conventions we have learned to take for granted. This entry was posted in Uncategorized and tagged AOMusic, Documentary filmmaking, Jessie Felix, Josh Massad, Karan Sharma. Filmaking, Kathmandu, Music and Children, Nepal, Richard Gannaway, Rob Lenfesty, Robin Tamang, Rock in Nepal. Orphanages.